Whether you are considering a California Beach Vacation or just an outing, you will find that Southern California Beaches are some of the most beautiful beaches in the world. In Los Angeles County, from Leo Carrillo Beach in the North to Redondo Beach in the South, you will enjoy surf, sand, and sunny weather. There are also plenty of opportunities for water activities, sight-seeing, shopping, dining, and people watching. Keep your eyes open and you just might spot some of the many famous celebrities who make California beaches their home, or come to shop, dine, and enjoy the beautiful weather along the coastline. From Santa Monica to Redondo Beach is about a 17 mile ride on a scenic stretch of smooth concrete beach path with a few bike lanes along the way. The communities listed below are popular hotspots for locals and tourists alike. Although this is officially part of the Marvin Braude Bike Trail, this is a multi use trail shared by pedestrians, rollerbladers, joggers, runners, skaters, cyclists, dogs, seagulls, and anything else that loves the beach. You might find it handy to have a bell on your bike. The Southern California Beaches in the Los Angeles County region begin in North with Leo Carrillo Beach and travel along the scenic Pacific Coast Highway to the South at Redondo Beach. 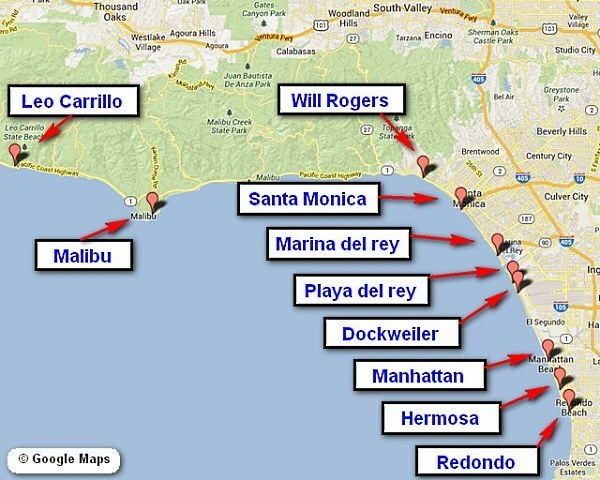 Further South towards the City of Long Beach is San Pedro and Cabrillo Beach.